Wow! That sounds amazing! I am glad these women stood up! 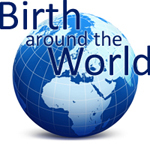 Brazil has one of the highest elective C-section rates in the world. Ihated being forced into the C-section of my second child, for lack of doctors trained in vaginal breech birth, I wish them luck! Makes you kind of wonder if it is all worth it, if even at the start it seems so upstream. Choosing to walk to school really shouldn't be such a trial. Hope the rest of your daughter's school journey goes more smoothly.